Orthopaedic Oncology Services are available in multiple locations in the Bay Area. Download a complete listing of locations. Our patients have access to many of the country’s leading musculoskeletal oncology specialists with the full range of diagnostic capabilities and treatment options. Using a team approach, we are able to advise patients and their families of the latest treatment options and offer timely, innovative and compassionate care in a personal and supportive environment. We provide expert care for benign and malignant bone and soft tissue tumors, as well as tumor-like conditions. The service coordinates treatment by a team of surgeons, radiologists, pathologists, medical and radiation oncologists, and allied health professionals at the UCSF Helen Diller Family Comprehensive Cancer Center. Our team includes experts in both limb salvage and specialized amputations procedures in the care of children and adults with bone and soft tissue tumors. Leaders in care: We are a leader in CT-guided percutaneous radiofrequency thermal ablation for the management of osteoid osteoma and other bone conditions. We provide decades-long experience in the use of preoperative chemotherapy for bone and soft tissue sarcomas in children and adults. We are also pioneers in the use of intraoperative radiation therapy for local control of sarcomas and other aggressive neoplasms. Individualized treatment plans: We hold weekly meetings of the multidisciplinary UCSF Sarcoma Program Tumor Board for consensus panel development of individualized patient treatment plans. Accessibility: We perform nearly 400 operative procedures and 2,000 outpatient office visits annually. Our team is one of the world’s leading orthopaedic oncology programs for use of compressive osseointegration (Compress) technology for endoprosthetic implants. Bones are the site of tumors that spread or metastasize from another organ, such as the breasts, lungs or prostate. Cancer that arises in the bone – primary bone cancer – is rare. Bone tumors may be benign or malignant. Benign bone tumors are more common, but both types may grow and compress healthy bone tissue and absorb or replace it with abnormal tissue. Benign tumors, however, don’t spread and are rarely life threatening. Compressive osseointegration technology: A principal research effort is directed toward the study of a novel means of fixation for endoprosthetic devices needed to reconstruct skeletal defects in cases of tumor resection and failed arthroplasty. Traditional usage of long intramedullary stems and cement has been associated with stress shielding, osteolysis, and ultimate failure. Compressive osseointegration technology achieves immediate, rigid fixation and subsequent bone hypertrophy that develops in response to compression forces. This result enhances the success and longevity of limb salvage procedures, especially in young, active individuals. 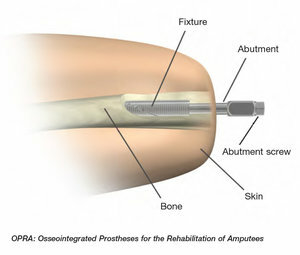 Immediate post-operative prosthetic fitting: When limb salvage is not possible, patients facing an amputation are routinely treated with immediate post-operative prostheses (IPOPs). Applied in the operating room by expert UCSF Prosthetists, these external devices are custom-fit to the patient’s residual limb. IPOPs help to mold and shape the leg, decrease pain and swelling, and allow weight bearing on the first day after surgery. Ultimately, standard prosthetic fitting is also accomplished much sooner. Adjuvants and bone graft substitutes: A variety of adjuvant measures are available at UCSF for intralesional management of benign bone lesions, including cryotherapy and argon beam coagulation. Packing is performed with bone cement or coralline hydroxyapatite, so as to minimize complications associated with traditional grafts. CT-guided percutaneous radiofrequency thermal ablation: Osteoid osteoma patients are treated in collaboration with the UCSF Department of Radiology with CT-guided percutaneous radiofrequency thermal ablation. This minimally invasive outpatient procedure is highly successful in precisely localizing and eliminating the painful osteoid osteoma nidus, so that surgery is generally no longer necessary. CT-guided ablation is also used for management of selected small metastatic deposits in bone, and CT-guided techniques are applicable for diagnostic biopsy of bone lesions. Multidisciplinary management of soft tissue sarcomas: Another intensive area of investigation is the use of pre-operative chemotherapy as part of a multidisciplinary treatment program for soft tissue sarcoma patients. Arising at a rate of just twenty new cases per year per million people, soft tissue sarcomas remain one the rarest forms of cancer. Fortunately, advances in radiologic imaging, surgery, radiation therapy, and chemotherapy have served to improve local control and overall survival. Wide surgical resection and external beam radiation therapy remain the mainstays of treatment. For patients younger than 65 years of age with large, deep, high grade tumors, pre-operative chemotherapy is also being offered in an attempt not only to treat the tumor itself, but also to decrease the risk of metastatic disease, thereby increasing overall survival. Intraoperative radiation therapy: The UCSF Orthopaedic Oncology Service is very fortunate to have access to state-of the-art intraoperative external beam radiation therapy machines which are used to apply radiation when and where it is needed most— directly to the soft tissue sarcoma tumor bed at the time of surgery. Close collaboration with the UCSF Radiation Oncology Staff has resulted in extensive experience with this technique that allows precise delivery of radiation, thus minimizing the extent of exposure and, it is hoped, improving function and the local control rate for these aggressive tumors.